SQL Server statistics are often thought of as a bit of a black box, this is completely not the case and I want to use this post to detail what they are, how they work and how we can view what they’re doing…. Statistics data is information SQL Server stores about what’s in your tables, SQL then uses this data to work out how to generate optimized query plans. For a simplistic example imagine we have a query to get a user by username the table has a clustered index on Id and a nonclustered index on username. For information about nonclustered indexes see SQL Server Clustered & NonClustered Indexes Explained. It could use the non clustered index that we’ve put on username to seek to the record in the index and then perform a key lookup back to the clustered index to get the the rest of the fields our query asked for. This is a very simple example so there is not much in each of these methods but we can image that choosing which of the above methods is fastest could depend heavily on the volume and kind of data that is stored in the table. Run the following script on a new database to setup our test table and seed it with data. If we then run a simple select query on our User table with 5 records which method will it choose to get the data? If we then repeat our select query the plan will now use our nonclustered index to seek to the username we’re searching for. We can see at this point SQL has decided a table scan is no longer optimal and has switched to using an index seek. 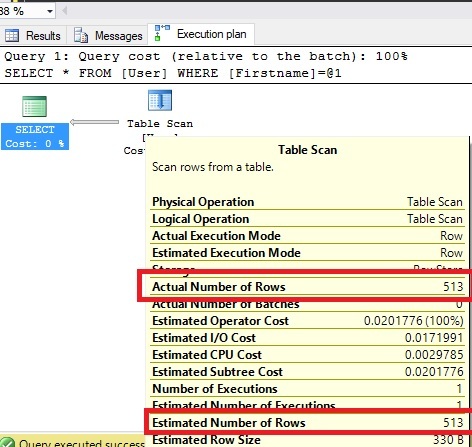 SQL Server doesn’t directly look at the table data before each query as that would be far to slow, instead it stores statistics on the volume and shape of the data in each table, then when creating a query plan it looks at the statistics to see which approach it thinks will perform best. 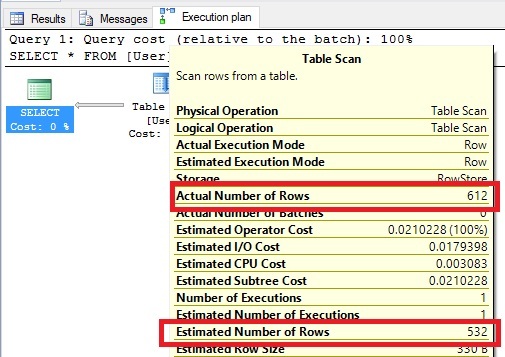 Given the statistics for a given column SQL Server can estimate how many values fall within a given range which can then be used to estimate the row counts for each step of our query plan to find the best path. Statistics are not updated in real time, when auto update statistics is enabled then they are updated after a threshold percentage of records is added or updated.. 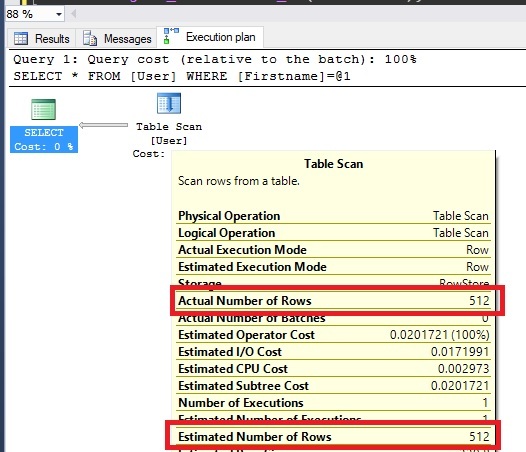 There are however a number of techniques SQL Server uses to still estimate row counts for given ranges on out of date statistics which we will discuss below. We can use the sys.stats view in SQL Server to see what stats we have on our newly created User table..
From this we can see when the statistics were last updated and also how many rows of the full data it sampled to generate itself. This is quite interesting as we can see an all density of 0.2. In our case we have 5 distinct firstnames and 0.2 * 5 = 1 which is how density is calculated, the lower the number the more distinct data you have. We’ll come to how this is useful in a little bit. Let’s imagine we have a table with 1 Million records, given the rules above that means that 200,000 rows can be changed or added before statistics are updated. In this case SQL uses things like it’s density measures and histogram steps to predict the amount of data a given operation will touch to generate an optimized plan. This works really well when the new data follows a similar cardinality pattern to the data in the statistics but can cause estimates and query plans if the new data changes this cardinality. Let’s run through an example of how out of date statistics can still generate good estimates. Reset and reseed the database with the scripts above. We can see the estimated number of rows is the same as the actual. Now lets add one row for each existing user, this wont cause the statistics to update because we’re not changing enough records. Run the SELECT query above again and you’ll see estimated 513, actual 513. So if the statistics are out of date how did SQL server get this figure? We can see 0.2 so we can see for a given range in the histogram e.g RANGE_HI_KEY = Luke the EQ_ROWS = EQ_ROWS + (5*.02) which gives us our value of 513. This is a good example of SQL Server getting accurate results from statistics even when they are out of date. Follow steps 1-4 in the above example to reset the data and statistics. We can see in this case our estimated row count is quite different to our actual row count, in this case the cardinality has changed sufficiently to throw the statistics out. Hopefully this shows that statistics are not just magic but are predictable things that we can view. For the most part assuming Auto Update Statistics hasn’t been disabled (It really shouldnt have been unless you have a good reason) SQL Server will manage the statistics without you having to do anything. There are cases though where the statistics are out of date and the cardinality in histogram no longer accurately reflects the data you are querying. A tell tell sign when this is happening is that when you look at your actual query plans estimated rows it’s radically different from actual rows. If you’re profiling a slow query and notice the difference in Actual/Estimated then it might be worth looking at the statistics to work out why there is a difference and if it could be what’s causing the slower performance. I mentioned above statistics are normally managed and updated with no manual input needed, however it’s common that maintenance plans run over night in periods of low to no use, you could add a step here to rebuild any out of data statistics. On the subject of maintenance plans Ola Hallengren has created a great one that I’ve used many times before, it will rebuild/reorganize indexes and update statistics allowing you to specify the methods it does this by along with the thresholds things need to be fragmented/out dated by. You can pass Sample counts into update statistics to limit the amount of rows SQL will sample and speed things up more information on this can be found on the Update Statistics MSDN page.